Create that classic Charles Dickens Victorian Peasant look with this great costume. 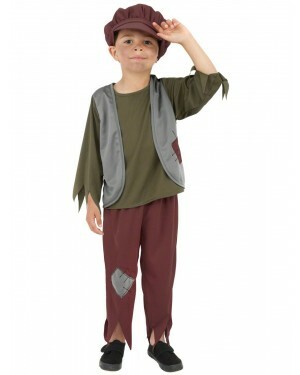 Featuring a waistcoat and cap this simple costume is perfect for School Book Week Fancy Dress or any historical fancy dress costume. The item includes a blue waistcoat with buttons, pocket detailing and Velcro fastening. Included with the costume is a brown hat with elasticated base and front peak. Simply wear this outfit over normal clothes to create that classic look. This costume is available in sizes Small, Medium and Large. Please see the below sizing guide for full information. This item includes the waistcoat and cap. Please note the t-shirt and trousers are not included.